Builders are increasingly concerned about the rising costs of meeting building code requirements for thermal performance. They’re also worried about the long-term liability and unintended consequences of building highly insulated exterior walls with an outer layer of impermeable continuous insulation that’s known to create a dangerous double vapor barrier. BUT THE SOLUTION IS SIMPLE! 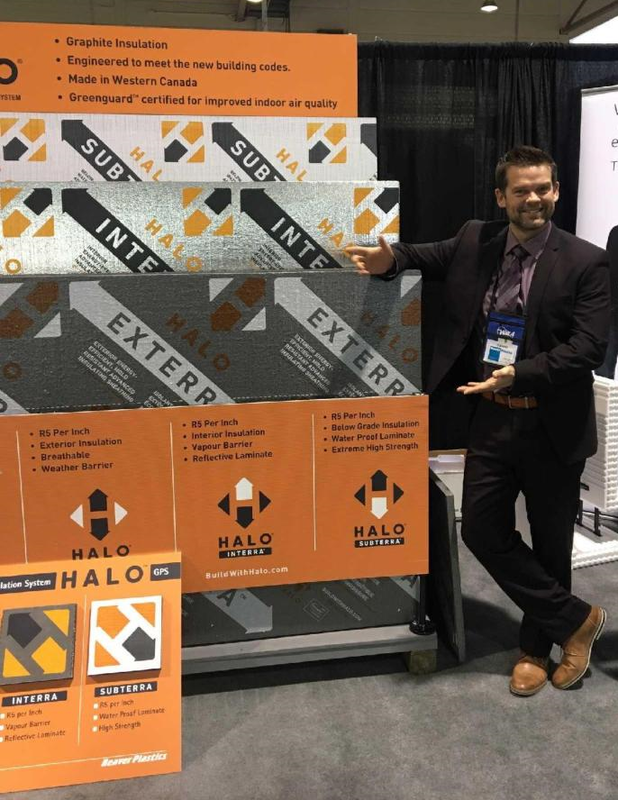 Halo® Exterra® is an easy-to-stock, easy-to-sell, breathable and continuous insulation that’s becoming one of the fastest growing building materials on the market. Unlike XPS insulation, Halo® Exterra® is breathable up to 2” thick, meaning there’s absolutely no risk of a double vapor barrier. And walls built with Halo® Exterra® are laboratory-tested to stay dry and healthy. What this all means is that builders no longer have to worry about costly liabilities and warranty problems — a builder’s worst nightmare. Halo® Exterra® is also one of the lower cost products in its category, so builders can continue to sell their homes with healthy and attractive margins. The most exciting aspect of this Halo® product is that our sales team will work for you to remove the hassles of adding a new product line, such as re-training employees and forming a relationship with a new supplier. Our team will train and educate your employees, as well as meet on-site with your customers to introduce them to Halo® Exterra® and the other Halo® insulation products. We’ll answer all of their questions and work toward driving additional sales back through your store. 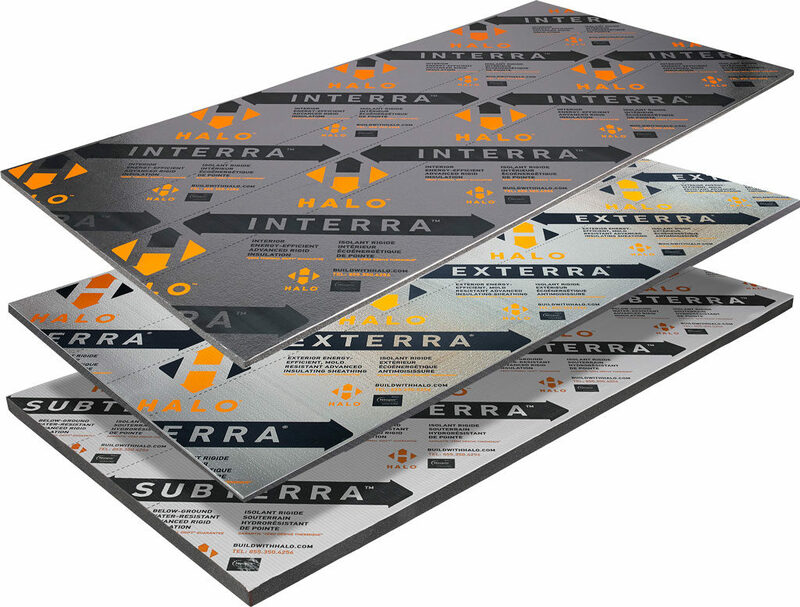 Halo® Exterra® is part of the Halo® Advanced Graphite Insulation System — a powerful and groundbreaking rigid insulation product line-up. From below-grade to above-grade, inside and out, Halo® is the insulating system designed perfectly for specific applications. Halo®’s high-performance graphite polystyrene (GPS) core is enhanced by a series of ingenious laminate surfaces, each customized to its specific usage application. The result is an advanced rigid insulation system that outperforms other more expensive XPS insulation. R-Value Doesn’t Deteriorate Over Time. XPS and ISO does deteriorate over time, whereas Halo®’s R-value performance is permanent, and the R-value is a full R-5 per nominal inch. How is Halo®’s R-value permanent? First, it’s made with graphite polystyrene (GPS) — the new standard in thermal insulation — and it uses air as an insulating gas. The air, graphite and polymer matrix are stable and fluorocarbons aren’t used. Halo® also has a unique closed-cell structure. Lower Freight Costs & Quick Deliveries. Halo® is made and warehoused in plants across Canada and the US, which means reduced freight costs and speedy deliveries. Often, local LTL deliveries can be made as well. Durable to Ship. Unlike XPS, Halo® is much more durable when it’s strapped down. This means that damage and loss during shipment to sites are virtually eliminated, allowing you to retain your profit margin. Competitive & Aggressive Pricing. Although Halo® is superior to other products on the market, it doesn’t come with a premium price tag. This is attractive to builders because it protects their margins as well. Walls Stay Dry & Healthy. With Exterra®, there is absolutely no risk of a double vapor barrier because it’s breathable up to 2”, so walls stay healthy over time. But wait… there’s more! No Additional House Wrap Needed. The laminated Exterra® panels have been proven NOT to let water into the wall, so no additional house wrap is needed. When Exterra®’s joints and fasteners are taped, the layer of Exterra® functions as the water-resistant barrier in the wall assembly. This eliminates all expenses related to installing house wrap. No Thermal Bridging. 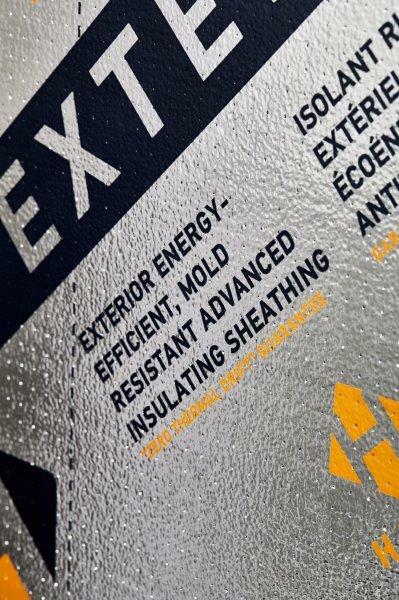 Halo® Exterra® eliminates thermal bridging and this dramatically increases energy-efficiency. Read more about Exterra® here. No Additional Interior Vapor Barrier Needed. When the joints and fasteners are taped, Halo® Interra® acts as the interior vapor barrier as well as a layer of interior insulation. Increased Thermal Performance & Energy Savings. When installed with an appropriate air gap, the reflective laminate can also reflect some heat back into the home or building for increased thermal performance and energy savings. Zero Breakage On the Jobsite & 30% More Strength – Laboratory Tested. Halo® Subterra® is incredibly strong and rugged; it’s able to withstand severe foot and equipment traffic without breaking. This is true for all below-ground applications, from perimeter insulation to under slab and grade beams. This means no extra expenses or delays due to breakage. It also means less time spent out on the jobsite. But how is this possible? It’s made possible by Halo®’s thick polypropylene laminate and an extra-durable cross-woven laminate in the case of Subterra® Plus. Subterra® Plus has been laboratory-tested to provide as much as 30% more strength than higher PSI XPS. Read more about the almost indestructible Subterra® here. FORGET THE HASSLE OF BRINGING ON A NEW PRODUCT LINE — LET OUR REPS GO TO WORK FOR YOU! Product Knowledge Sessions & Training with Staff / Customers. Our reps are always available to problem solve and offer advice. On-site Meetings With Your Builder Customers & Local Building Officials. We’ll drum up business for you, and to avoid needless surprises, we’ll also make sure the local building officials have all the information they need as well. Lunch & Learns With Architects To Drive Specs. Drive More Sales With Store Samples & Displays. Samples and literature are readily available so that you SELL MORE. Whether you need a wall display, a mini-display, or a full-size display, we have a solution for every store. Online Resources For Staff & Customers. From webcasts to a technical library to our Halo® One Minute R-Value Calculator (that quickly designs wall assemblies that meet local building codes), we give you, your people and your customers the support that’s needed every step of the way. Do you want more sales for your store this year? Then the Halo® Advanced Graphite Insulation System is for you! Simply put, Halo® saves your customers time and money, and our team is ready now to go to work for you. Start getting more sales this year! 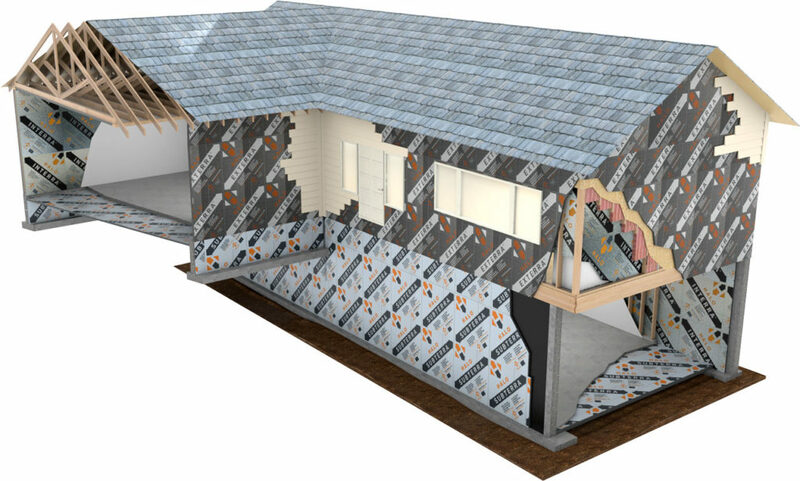 Click here to learn more about Halo® — The Advanced Graphite Insulation System.